While coal’s air pollution already places a huge burden on the economy, environment, and human health in China, the risks for water supplies in the country’s arid north are potentially even greater. Half of China’s population and two-thirds of its farmland are already vulnerable to worsening droughts and water pollution. Nearly half of the groundwater in northern China is so polluted it cannot even be used for industrial purposes. Beijing, which is one of 71 cities in northern China facing severe water shortages, is only able to provide its residents an average of 100 cubic meters per person each year — similar to water scarcity levels in Saudi Arabia. To improve understanding of water scarcity and pollution among the coal industry, China’s leading pollution transparency NGO, the Institute of Public and Environmental Affairs (IPE), has created a Corporate Water Risk Assessment Tool. Coal is among the “thirstiest” of energy sources, using large amounts of water for mining, washing, power generation, coke production, and coal-to-chemical operations. The water needs of China’s coal industry — including 2,769 power plants and more than 130 coal-conversion plants — are particularly challenging, because most of the country’s coal is located in the dry north, particularly the northwest. According to China Water Risk, 30 percent of Chinese coal reserves are in water-stressed regions and 53 percent are in water-scarce regions. The Choke Point: China initiative, launched by the Wilson Center’s China Environment Forum and Circle of Blue in 2010, found that somewhere between 12 and 20 percent of all water used in China goes to the coal sector. As the country’s energy demand continues to soar, China will likely not have enough water to supply its thirsty coal sector. 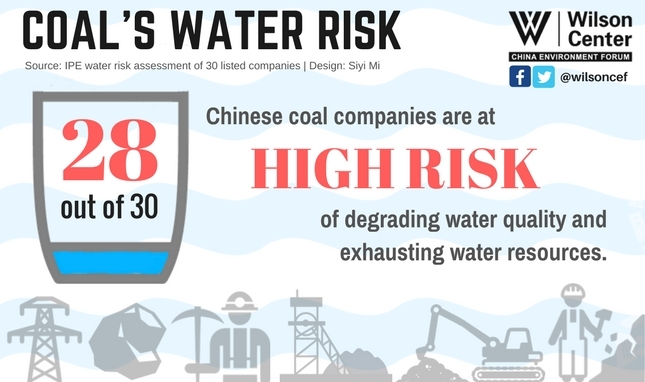 Despite growing water constraints and stronger regulations around water pollution, many Chinese coal companies do not have adequate water conservation and wastewater management practices, which will ultimately undermine the sustainability of the coal industry. To help publicly listed coal companies, investors, and supervisory departments better understand their industry’s water risks, the Institute of Public and Environmental Affairs (IPE) developed the Corporate Water Risk Assessment Tool (CWRAT) in 2017. IPE is a nonprofit environmental research organization registered and based in Beijing that is dedicated to collecting, collating, and analyzing government and corporate pollution information. IPE has developed numerous tools that promote open information around pollution in China, such as searchable pollution maps and indexes that evaluate pollution emission transparency of cities and supply chains of corporations. With this new tool, IPE’s Green Finance project team measures risks from water consumption, wastewater discharge, and compliance. To evaluate the level of compliance risk, CWRAT incorporates internal factors, such as a company’s business structure and water management measures, as well as external factors, such as local water endowment and the effectiveness of local government in enforcing pollution control policies and information transparency. IPE used its tool to evaluate the 30 top-earning coal companies listed in the Shanghai and Shenzhen stock exchanges, finding that most face substantial water risks. By sharing this information with companies, IPE hopes to catalyze better corporate practices that will reduce water problems in the ecologically fragile areas of China. After refining its water risk tool, IPE plans to apply it across other industries in China, such as manufacturing and papermaking. The China Environment Forum interviewed Mingxuan Wang, the lead author of IPE’s report on its Corporate Water Risk Assessment Tool, to learn how it works and what are the next steps for IPE. Q: With this tool, you and your team at IPE are not just looking at the risks caused by poor water management by coal companies, but also at risks associated with national and local policies. Tell me more about this two-fold analysis of water risk. A: Local factors, such as the amount and distribution of water resources and the water ecosystem’s carrying capacity, are one aspect of a company’s water risk. It is important to also know the rigorousness of local government regulations; their capacity to regulate gives us insights into pollution control enforcement. We therefore integrated local regulations and policies into the tool so we could carry out a comprehensive and accurate assessment of a company’s water risk. Since 2010, IPE’s Information Transparency Department has been doing annual evaluations of the information transparency of 120 municipal governments. IPE has published this information in a yearly Pollution Information Transparency Index (PITI), which has helped educate municipal governments on their progress in complying with China’s open information regulations. We believe more transparency of pollution information leads to better enforcement and cleaner water. We incorporated this PITI data into the water risk tool’s assessment system and were able to identify provinces with low levels of information transparency, such as Shaanxi, Shanxi, and Henan, where most of the companies we assessed are located. Insufficient supervision and limited information transparency in these provinces will undermine the effective regulation of coal industries’ water consumption and wastewater discharge. The water risk is therefore higher for companies in localities that have low information transparency. Q: What are some of the most interesting or surprising findings in this report? A: Extensive studies have pointed out that most coal reserves in China are located in water-scarce regions. Our research not only confirmed these findings, but also found that the majority of coal businesses were operating in places with poor water quality, low water environmental carrying capacity, and low water resources carrying capacity. Among this first group of companies we evaluated, 28 of the 30 are located in the Huai and Yellow river basins, which are areas that the Chinese government has categorized as high risk. The coal industry’s high dependence on water could degrade the water quality and exhaust the water resources in these ecologically fragile regions. Strikingly, most companies have not realized the importance and urgency of understanding the risk they pose to the surrounding water ecosystem and thus still disregard the wastewater discharge regulations. Using our Blue Map Green Securities Database, we discovered 19 of the 30 companies each had over 100 violation records with total penalties exceeding four million RMB (~$580,000). These 19 companies failed to disclose their environmental violation records, clean-up records, or environmental performance index in their annual reports. Even worse, IPE’s PITI revealed that the provinces we identified as having low levels of information transparency also happened to be where a majority of the assessed coal companies were located. Q: The 30 assessed companies scored 58.27 on average, which means they all face considerable water risks. What can the companies do to reduce the risks? And what are the challenges? A: In the last section of the report, we provided some specific recommendations with regard to each indicator. For example, in order to ease the water consumption risks, companies need effective management of both water usage and wastewater discharge. There also are needs for alleviating the water shortage and improving water quality. It merits mention that a company’s risk is not always high in areas with dry climate or poor water quality. We have examples of companies receiving a good score because they demonstrated effective water conservation and disposal measures. Our water risk tool can help internal management at companies to better understand industrial standards and how improving energy efficiency and lowering emission reductions could help the company mitigate the regional water risks. We have been concerned about the issue of compliance for many years and we do not anticipate that every company will be perfect, but we do hope they can at least meet the basic requirements of national environmental regulations like the Environmental Protection Law. Compliance must be the first step because failure will result in direct financial losses. Compliance is not like other indicators (water consumption and wastewater discharge), which cannot be assessed by cash flow. The company’s operation will be impaired if it faces penalties, restrictions, or even a shutdown. Therefore, we believe compliance is the first thing companies should do. A second point is about the information disclosure of the listed companies. The most challenging part is that a company is not likely to disclose anything against them in its annual report. Another challenge is the location. Companies are unlikely to reallocate their assets given high regional water risks. The key to reducing regional water risks is to understand local water policy and the water usage of stakeholders. Q: The report mentioned that both the accuracy and coverage could be improved if there is more information disclosure from the company side. What role did companies play when you were preparing this report? And what about the government? A: We tried to email the companies and even made a call to one company’s board secretary. Nevertheless, we received no responses, so the engagement of companies is one missing part in this report. We’re hoping to draw more attention from the companies through the publication of this initial trial application of the water risk tool and get their feedback and relevant information. So far, no one has reached out to us. As for the government, we didn’t loop them in for this research directly. However, we have been working with some industrial experts. One of our coal experts used to help design the national standards for China’s coal industry. When we first started doing the PITI, government officials in cities received it rather coolly, but today we have extensive communications and interactions with government officials about the PITI report, often asking us how they can improve their transparency. Therefore, we could say government did play a role in this report. Q: With respect to corporate information disclosure, what information does IPE expect will be disclosed more accurately and more comprehensively in the future? A: IPE’s Green Finance project is centered on information disclosure in listed companies. Last December, China Securities Regulatory Commission (SRC) issued a document requiring listed companies, especially those identified as major emitters by the environmental protection department, to report their environmental performance. It is something we had been advocating and the policy just took effect. We look forward to reviewing the 2016 corporate annual reports and seeing if they comply with the SRC requirements. We hope this new water risk tool and the report we have produced will provide the government with some insights into the coal industry, especially from the perspective of water management, and present companies with guidance on the importance of water consumption, reuse, and conservation measures and on meeting wastewater discharge standards. Q: Is it fair to say that in recent years that China is doing better in disclosing pollution information? Have you seen any progress from the government, industries, and the public? A: It is, for sure. From the monitoring records we have been collecting in recent years, we recognize a significant increase: from only thousands of records in the first year to over 100,000 records in the first four months in 2017. That is a substantial change. Indeed, we are not the only one working on promoting information disclosure. Many nonprofit organizations and other societal stakeholders are working on this as well. The environmental protection agencies have also increased their response to the public. For instance, our Weibo reporting is getting more and more attention and replies from China’s environmental protection agencies. Li Xia is a researcher with the China Environment Forum. Sources: Central University of Finance and Economics, chinadialogue, China Environment Forum, Circle of Blue, End Coal, Institute of Public and Environmental Affairs. 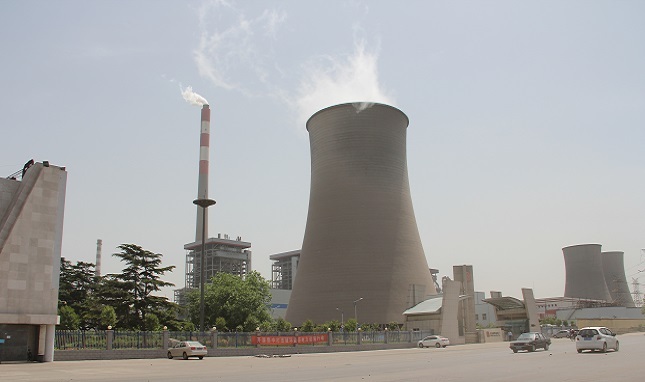 Photo Credit: Coal-fired electric plant, Henan Province, China, May 2014, courtesy of V.T. Polywoda.